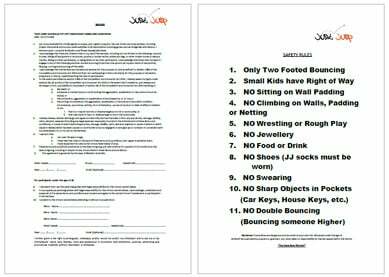 Please click on the image below to download our Waiver and Indemnity as a PDF. 18 MUST be supervised by a parent or guardian. Just Jump takes no responsibility for injuries caused within the Centre. Please contact us on 08 9306 3567 if you have any concerns or questions. Parkour Safety is a top priority at Just Jump Perth. Please read through the rules and abide by them. Always listen to staff, they will only ask you to stop something if it looks or is dangerous.